Spring has definitely sprung judging by all the fresh local berries available in southern California right now. These berries have inspired us to eat a strawberry, blackberry and ginger cobbler made with fresh, local berries, ginger juice, and a crumbly, ginger biscuit topping. The whole dessert is topped off with a scoop of natural vanilla bean ice cream and garnished with a sprig of mint. A: hey tyler… i think i have a problem. A: heheheh okay, i know i have several problems, but there’s one in particular that’s affecting me right now. I just can’t seem to stop buying berries! they’re everywhere and i just buy buy buy. it’s like some kind of sick disease. T: i gotta say this is the least of your problems. It’s not a sick disease. Wanna know what’s a sick disease? buying freaking california burritos all the time. That’s sick. I think I can feel a piece of beef lodged in my heart. A: 😛 now that is sick! you’ve got some kind of effed up digestive track if whole chunks of beef are making their way to your heart! T: it started off as cholesterol, and slowly collected itself until it was whole again. Eventually, if I did not have a heart attack first, a cow would burst out of my chest. A: sweet! then we would have dinner for ages. a whole cow would feed us for a while 😉 i don’t really want you to either have a heart attack or have a cow burst out of your chest….uh, so maybe you’re gonna want to find a new disease. like my berry buying disease! T: my office is actually surrounded by taco shops. In every direction. We even share a wall with a taco shop. If I go to the bathroom, and sit quietly, I can hear mariachi music. And then images of burritos start dancing around in my head. And they don’t sell berries. So basically I’m screwed. A: you could always look for a new job that’s located next to a berry stand rather than hundreds of taco shops…. you could even work at the berry stand. A: ah yes, the outcome of my berry addiction. So at the end of this week, we had over three pounds of strawberries in our fridge. not to mention a couple pints of blackberries and a half pint of blueberries. what’s a girl to do with all those berries other than make a strawberry ginger cobbler. T: I can think of a couple of things. But let’s not go there. The cobbler was a good choice. 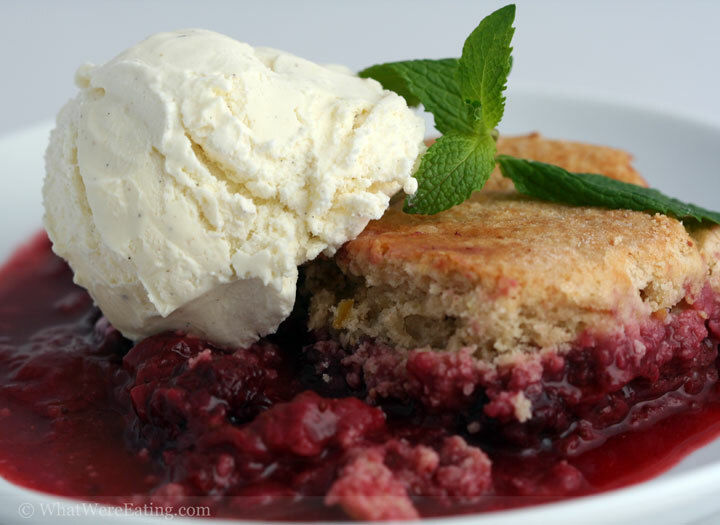 Have you ever made a cobbler before this one? A: to tell you the truth… no. i generally take the easy way out and make crisps. they take much less effort on my part. i grew up eating TONS of cobblers though. T: All the cobblers I’ve had (which have admittedly been frozen from the grocery store) have had a flaky pie-like crust rather than a bready biscuity crust. But I like it both ways. Did you grow up with the bready crusted cobblers? A: for the most part i did. i grew up with a doughy topped cobbler. in my mind a cobbler shall never have a crust, which would imply that there is a bottom dough to it. only stuff on the top. T: I guess I’m just talking about the height of the top layer. This one was fairly cake-like, whereas the ones I’ve had in the past were a dense flaky layer. Did you grow up with the cake-style? A: first off, i wouldn’t call it “cake-style”. i would call it doughy. and yeah, i did grow up with doughy cobblers. this was topped with biscuits… gingery crumbly biscuits. it’s not the same as what i grew up eating, but i enjoyed it none-the-less. T: yeah, i liked it too… however you choose to describe the top. Got a rating for it? A: I do. I give it a 3.8/5. It was a touch on the tart side, but otherwise yummy. i actually prefer to eat berries raw, but a crisp or a cobbler is a good way to go if they’re about to go bad. T: I give it a 4.2/5. There was something missing, although sadly I don’t have a clue what that could be. Maybe salt in the top layer, maybe sugar somewhere. I don’t know. I’m not a cook. I just eat. Definitely tasty, though, and much more filling than berries by themselves, which is a good thing sometimes. A: i know what you mean about there being something missing. I wasn’t fully satisfied with the outcome of this one. tasty – yes. lacking something – for sure. what – i have no freaking clue. and i am a cook… although i don’t really do sweets too well or too often! T: I think you do sweets very well, actually. You’ll just have to keep making cobblers until you’ve perfected it. That should help out with your little berry disease. See? I’m just looking out for your health. Now make some more cobblers, woman. I have to admit that I’m more of a crisp-type person (surely the oats in the topping make it healthy? ), but your cobbler looks delicious! Okay, it’s obvious that you are just taunting me! This is something I can’t wait to make, berries, ginger…mmmm sacrilicious. Are you trying to kill me? I have a knot on my forehead from the blow my monitor gave me as I tried to jump face first into the screen to eat that delish cobbler. I got back from fabulous eating in Chi-town yesterday only to find an inch of snow on the ground…Spring? Spring ain’t even nudged a little here……Ship me some, soon??? I just returned from San Fran where the gorgeous weather and the plethora of yummy fruits and veggies at the farmer’s market started to make Chicago seem like a desolate block of concrete. Back in the upper midwest, we will just continue to look at your photo and dream of the day we can make such a delicacy…. Blackberry Cobbler, is that someone who makes shoes out of cellphone thingies? I’m so glad Spring is finally here – now if only the weather would cooperate. The cobbler looks delicious! cobbler, crisp, its all good to me! spring is sprunging, you have inspired me to make something with berries. i especially like tart flavors so this sounds delish to me! you are one silly ho, maegan. it really had been ages since i glaced at the weather to know how the rest of the country is living. i just today saw a passion fruit at the o.b. farmers market! (which i haven’t seen before. i just got your email like, two minutes ago….. soooo i guess it’s too late to help out! oops. call me! mmmm beeeeries… whiiiiipped cream. oh yeah, denise! you are right on my level. it wouldn’t be too sweet but shear perfection for a breakfast! you know, bobby, i’m sure there must be a good creamery here somewhere, i just haven’t found it yet. now i’m not too big on the cheerios, but i’ve been doing fresh berries, yogurt, a touch of honey, and sprinkle of granola for breakfast and it’s really been rocking. of course it’s like a 2:1 berry to yogurt ratio. you know, i actually thought the same thing with the word cobbler and considered using it in the title, but usually tyler shoots down my cheesiness so i didn’t even mention it. I know cate! i can’t stand the cold weather. it’s even been chilly down here in san diego the past few days! at least we have the veggies to keep us company. i can’t wait to see what Aria the Tart(! )will do with berries! how exciting. 😀 what a great name….you will now officially be called aria the tart from this point hither! you join the ranks of pepita brittle. Amanda, thanks for the okay with the fruit salad picture. I’ve been reading some of your blogs and I’m going to be visiting your site a lot more. I’ll let you know when the link is live.